December 31, 2013 (Tony Cartalucci) - On December 26, 2013, in Din Daeng district, Bangkok where protesters clashed with police in an attempt to disrupt the regime's sham elections in which only Thaksin Shinawatra's illegitimate political party will run unopposed, there were two deaths and scores injured. The moment Police Sergeant Major Narong Pitisit was injured, the regime's propagandists began exploiting his and his family's tragedy by immediately blaming protesters battling police in the streets. He would later die, and immediately, the regime made a political spectacle out of his death. On December 30, some 500 police would assemble near anti-regime protesters and demand the right to "defend themselves" in the wake of Police Sergeant Major Narong Pitisit's death. 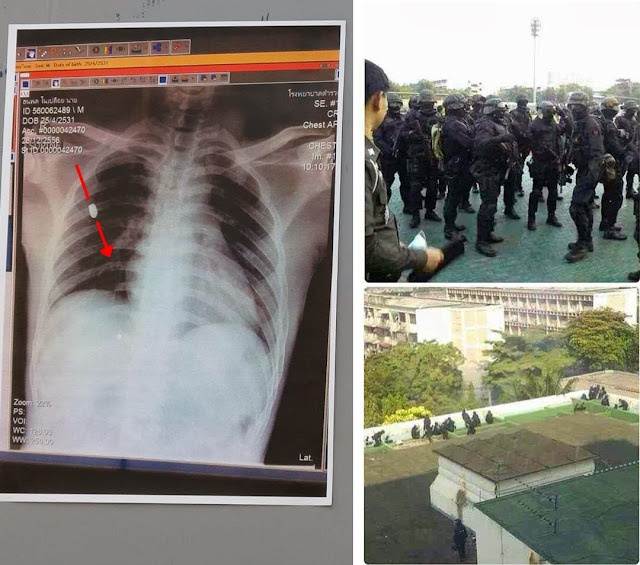 In contrast to the regime's exploitative behavior, the anti-regime protesters have demanded now on multiple occasions a full investigation into the violence of December 26, including into the death of Police Sergeant Major Narong Pitisit. Anti-government protesters have demanded the authorities’ clarification over shootings at demonstrators by police and men in black at the Thai-Japanese stadium on December 26. Akanat Promphan, spokesman of the People’s Democratic Reform Committee (PDRC), said yesterday that caretaker Prime Minister Yingluck Shinawatra, her caretaker deputy Surapong Tovichakchaikul and National Police Chief Adul Saengsingkaew must explain to the public on the violence which killed and injured scores of people. It is truly telling that in the wake of violence anti-regime protesters are demanding a full investigation, while the regime sidesteps what would be the only legitimate option (a full investigation), and instead pursue the grotesque spectacle of politically exploiting the death of their own fallen police officer. For the Royal Thai Police, this is a signal from the regime of how they truly view the police who have been fighting for weeks to assist the regime's clinging to power. To Thaksin Shianwatra and his subordinates, the police are nothing more than cannon fodder to be used, abused, and exploited. The truth, and therefore true justice, will never be uncovered in the case of fallen Police Sergeant Major Narong Pitisit, because the regime itself is not interested in it - only in riding his corpse for as long as possible/profitable for their own benefit. That the anti-regime protesters are more concerned for justice in his case despite having been brutalized by the police and now the subject of overt threats and deadly attacks on an almost nightly basis, than the regime itself, speaks volumes of who is on the side of right. The regime's behavior in regards to their own fallen police officer is yet another reason why it must be completely and permanently uprooted.